Difficult Women is a difficult read. It is raw and real in a way that will shake readers to their core. Gay’s stories are the society no one wants to acknowledge. The open secrets we all know exist but, for whatever reason, can’t be spoken in the daylight. If you are a reader that needs an uplifting moment, many of the stories won’t provide that emotional boost. The focus of Gay’s stories are most certainly the women. Gay’s characters are diverse. As women, we often take on responsibility for things that go wrong. We hear our mothers ask what that woman was doing with that man alone when she’s assaulted or an analysis of her behavior with men and how it was “bound to happen.” Even as it doesn’t pertain to violence, Gay’s women take the weight of actions not their own. Complicating the female perspective are the rough-hewn and undeveloped men direct from central casting. There’s no need to stray outside of the bonds of evil because even in moments of pleasure, there’s nothing but pain. In the stories of violence, the men are horrible and maniacal lacking only a mustache to twirl. They are wholly vile without the need of development. Break All the Way Down was an especially difficult read. A woman loses her child and is enveloped and lost in pain. The mother’s depth of despair was so real and raw, this reader was left in tears. Perhaps as a parent, such a story is more heart-rending. Many of the stories in Difficult Women are sexually graphic. Bad Priest is the story of a priest having an affair with a much younger woman and they are quite sexually active. As a reader, I just found the story strange. I think, as readers, we’re supposed to be uncomfortable with most of the collection. Perhaps the most timely story is that of a woman who is sexually harassed by her boss and gives in to him as she needs the job. There are a number of stories in the books I haven’t mentioned and many that are worth reading. There’s a reason this book was nominated for a literary award. There are times when the dialogue is trite and the situations are clich,e but overall this is a book well worth reading and that will stay with those who have a social consciousness. We must do better. If you’re looking for a good read and don’t mind cringing, pick Difficult Women up today. 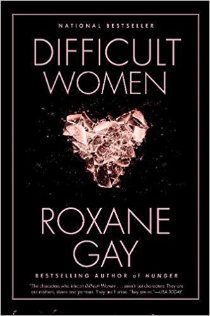 For more information about Roxane Gay, visit her website. You can connect with her on Goodreads, Facebook and Twitter @rgay.